As the label says: " Inspired by the trench coat of the Burberry brand, My Burberry captures the fragrance of a London garden after the rain. Its contemporary floral scent features a delicate heart of rose woven with a unexpected touch of geranium leaf." This is my new favorite perfume, I actually went to the store to buy Jimmy Choo Illicit Eau de parfum, but after I smelled this 'My Berberry' perfume, I knew I had to have it. It's a fresh, soft floral, a bit powdery and someway unisex scent, that makes this fragrance so special to me. This Burberry perfume doesn't give me a headache because I don't detect any alcohol from the first minutes I apply it which is a huge plus, it's not overpowering scent but when you wear it, you feel so confident and powerful. Now, let's talk about lasting power: I usually get turned off when a perfume doesn't last all day, especially if I pay over $100 for a flacon, and I can't say 'My Burberry' lasts all day, maybe 6-7 hours, but believe it or no, I'm OK with it, because I love this scent so much, that I'm ready to re-apply it after 6 hours, without complaining. The flacon is stunning __ it's made of glass with a stopper inspired by the bottom of a Burberry trench coat and how cute this ribbon is, that is made of the same fabric as the Burberry trench. This is actually my first Burberry perfume ever and I'm sure I will re-purhase after I finish this flacon. 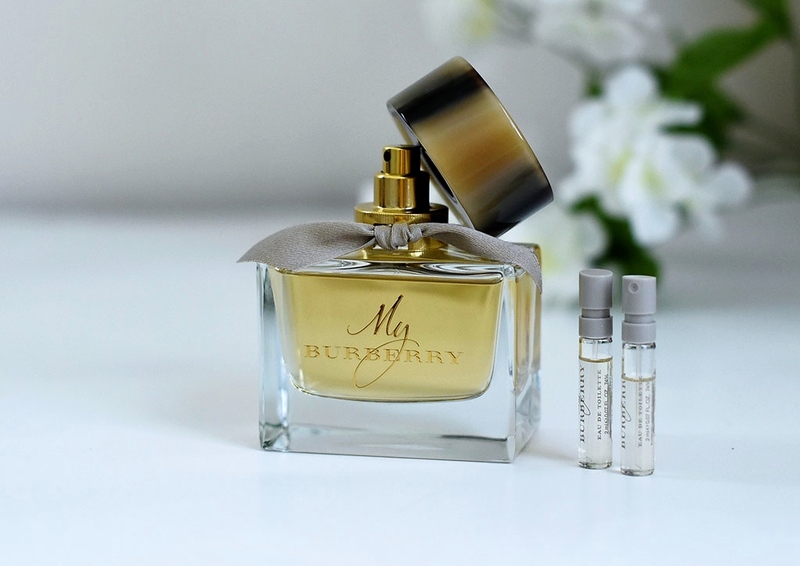 I'm a fan of Burberry perfume, What a lovevly post! Thanks for sharing! Burberry scents is just heavenly. This is my favorite perfume. thanks for review. This sounds amazing! I must give this a try! Good luck with the move hun! I hope it's everything you have ever dreamed of! Such a great review :) I'm a bit obsessed with perfume. I love a good floral perfume! I´ve heard a lot of good things about this parfum, apparently everyone loves it! This sounds amazing. Burberry perfumes are one of my favorite. Sounds like a dreamy scent! And good luck on your move!! Love this essence, Burberry is a great st brand! Burberry has some great scents. Hope your move goes well! This sounds like a lovely scent and I really like he bottle too. That's a very stylish bottle, I love the stopper! First of all, amazing perfume, I guess - Burberry is always a brand with high quality! I like the base notes, patchouli is one of my favorite scents! And lasting for 6 to 7 hours, it seems it's good. Good that you found a nice place, and where there's a great school for your daughter! I post once a week now for around two years, because there's so much to do, so, don;t worry now, your place is more important now! Wishing you a great week! You are right, there are so many things to do sometimes it's difficult to keep up the blogging schedule. Hope you are having great week so far, Denise. This is such a heavenly scent! Sounds really convincing to try it out! I totally know how busy a move is! Definitely not conducive to a blogging schedule =( Hope everything runs smoothly! This sounds lovely! I love all the notes that are included in this, especially bergamot! Great review and I am definitely going to check this guy out. Congrats on your new place! Great product review girlie! So glad you shared. What beautiful packaging, great pictures too! This perfume sounds so amazing I need to put it on my list to try next! I am obsessing over the look of the bottle! I need to try! 6 to 7 hours isn't bad at all , I 've bought some perfumes that didn't last an hour and I had my regrets. Thanks for the review I love the design of the bottle. It's a shame the scent doesn't last a bit longer but I agree, it is a beautiful perfume! Glad you move worked out nonetheless and I LOVE Burberry perfume! One of my faves! I'm a fan of Burberry perfume. I have a deluxe size and I've used it a couple times and love it. I have the full size on my wishlist. Lovely post! I love fresh floral scent perfumes! Nice review. Congratulations on finding a better place even though you lost the other, sometimes things happened for a good reason. I have yet to try any Burberry perfume but it's in my list! I'm glad you managed to find a place after the first disappointment. Hope the move goes well! Completely natural for blogging to take a break for a while! That packaging is just lovely! The notes sound amazing. I've never tried Burberry fragrances before, but this may be my first to try! Oh, I love freesia! And Burberry is such a great design + fragrance house. Love this perfume! Thanks for sharing.